↑ 1.0 1.1 The official Spanish language of the State is established in the Section 3 of the Spanish Constitution of 1978 to be Castilian. 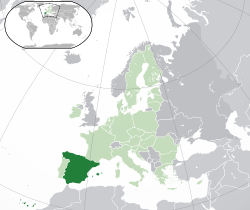 In some autonomous communities, Catalan, Galician and Basque are co-official languages. Aragonese, Asturian, and Occitan (locally known as Aranese) have some degree of official recognition. ↑ As of July 2015, Spain's population was 46,439,864. In the same month the number of citizens with Spanish citizenship reached 41,996,253. The number of foreigners (i.e. immigrants, ex-pats and refugees) permanently living in Spain was estimated to be at 4,426,811 (9.54%) in 2015. ↑ "The Spanish Constitution". Lamoncloa.gob.es. ओरिजनल से 25 मार्च 2013 के पुरालेखित. पहुँचतिथी 26 April 2013. ↑ "Anuario estadístico de España 2008. 1ª parte: entorno físico y medio ambiente" (PDF). Instituto Nacional de Estadística (Spain). पहुँचतिथी 14 April 2015. ↑ "Cifras de Población a 1 de julio de 2015. Estadística de migraciones. Primer semestre de 2015. Datos Provisionales" (PDF) (Spanish में). Instituto Nacional de Estadística (INE). 4 December 2015. ↑ 5.0 5.1 5.2 5.3 "Spain". International Monetary Fund. पहुँचतिथी 8 May 2017. ↑ "Gini coefficient of equivalized disposable income (source: SILC)". Eurostat Data Explorer. पहुँचतिथी 22 July 2014.